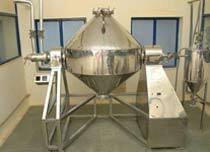 Being one of the eminent entities, we are instrumental in offering Rotocone Vacuum Dryers to the clients. 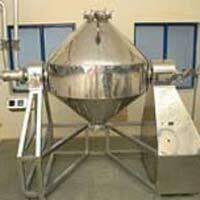 We are based in Maharashtra, India. Owing to their efficient functioning, robust structure, sturdy structure, and long working life, these are copiously admired by our clients. We are endowed with an ample storage facility, which enables us to meet the bulk and urgent requirements of the clients on a timely basis. We offer them at a highly feasible rate. 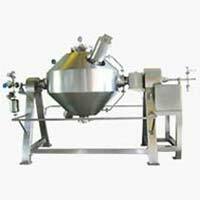 Detail : It is a multipurpose drying unit that is extremely useful for uniform and low :temperature drying of heat sensitive chemicals, pharmaceutical formulations, fine chemicals etc. 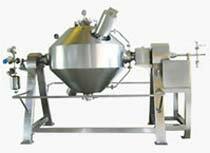 It has a double conical vessel with a rotating system and vacuum solvent recovery system. As the dryer is rotating, there is no charring or retention of the product. The result is that one can change the material to be dried without much toil. It rotates at a very low speed (5 to 15 rpm) and thus, has very low wear and tear.